2006 dodge quad cab 1500 hemi motor need to change a/c condenser fan motor does gas have to be removed ? To replace the condenser fan motor you have the remove the fan as an assembly with the condenser. The condenser fan blade, shroud and motor all come out as an assembly, and then you can disassemble everything once it's on the bench and replace the motor. Since the condenser does have to come with the fan assembly this will require you to recover the refrigerant from the a/c system. If you don't have an a/c recovery machine then you could have the system recovered at any shop or dealer, do the repair yourself and save some money, and then have it charged again when you're done. If the system is fully charged now then you wouldn't have to pay for any refrigerant, just the labor to have it done, which should be an hour or less. The problem is faulty condenser fan motor. The condenser fan motor has gone out.It is the fan on the drivers side of the truck behind the condenser. It has also probably blown the fuse under the hood. 2007 Dodge Ram 1500 condenser fan does not run. Fan seems to be free and no reason for fan motor to go bad. Is it faulty relay or fuse.What relay, fuse, or any other item do you know of that will go bad. Sensors? Where is the relay located? 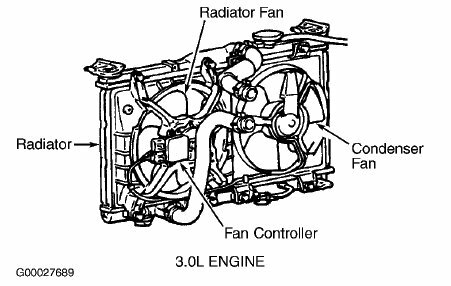 The A/C condenser fan used in gasoline engine equipped models (except SRT 10) is controlled by the powertrain control module (PCM). 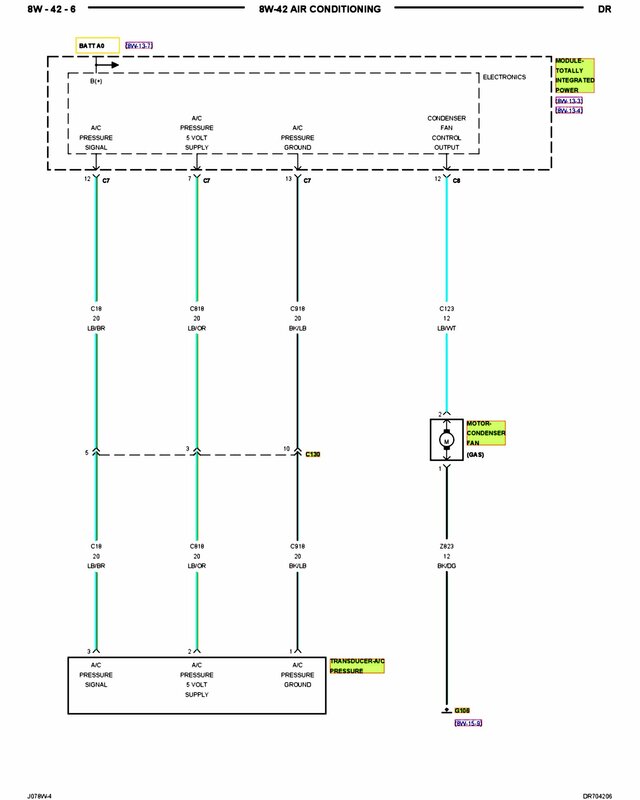 When the A/C-heater control is set to any A/C position, it sends a request signal on the CAN-B bus to the totally integrated power module (TIPM), which then transfers the request on the CAN-C Bus to the PCM/ECM, which sends a signal on a dedicated hard-wired circuit to the totally integrated power module (TIPM) to energize the internal A/C condenser fan high side driver. When energized, the A/C condenser fan high side driver provides battery current to the condenser fan motor. The A/C condenser fan control system is diagnosed using a scan tool. The components of the A/C condenser fan cannot be adjusted or repaired and must be replaced as an assembly if found inoperative or damaged. 2001 dodge stratus 2 door coupe 3.0 V6 .Out of two cooling fans,the cooling fans on the drivers side works but one on the passenger side don't. Is it ok to run the car without the condenser fan running will it overheat? The condenser fan will only come on with the A/C. In extremely hot temperature situations the computer may command both fans on with the A/C off, but under normal conditions only the radiator fan will operate to cool the engine and the condenser fan will only operate when the A/C is on.